I’m Karin Harper, retired educator from south Louisisana. As a child, my family vacationed every year at the same spot along the Florida panhandle. What can I say, it’s hard to break the “beach" habit, a teaching schedule allows for numerous opportunities for respite. 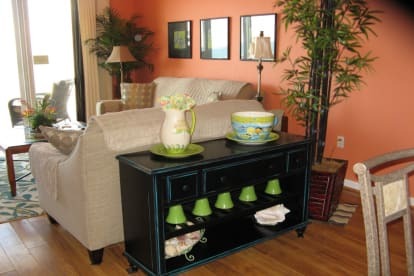 To take advantage of this, I initially purchased a smaller unit with a Gulf view, but soon felt that my dream would not be realized, until I was ON THE BEACH! In 2008, I had the opportunity to make Gulf front living a reality, thus I want to share my second home with you! Everything you need is here, even the beach towels, just stop at Publix to “make” your groceries. Relax…feel your pulse slow, Perdido Key and the Windemere complex is extremely laid back. Looking east from your balcony there is a single family home that is on the mend after hurricane Ivan, a little further, The Palms, a rent restricted, two units per floor, high end complex, where you never see a soul beach front. Immediately west of the complex is an empty lot, waiting for the best offer to come along. Yes, it really is that quiet here! If you like a good beach walk, the Perdido Key Preserve starts a half mile from the front of our complex. Walk west to view the multiple sea turtle nests that dot the beach and enjoy a truly spectacular sunset!